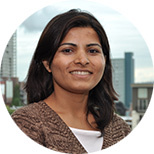 While at IHME, Ranju worked on the Disease Expenditure and Effective Coverage research teams. Following the Post-Graduate Fellowship, Ranju worked as an Economist on the Malaria Elimination Initiative at the University of California, San Francisco. Hernandez-Garbanzo Y, Brosh J, Serrano EL, Bhattarai R. Psychosocial Measures Used to Assess the Effectiveness of School-based Nutrition Education Programs: Review and Analysis of Self-report Instruments for Children 8 to 12 Years Old. Journal of Nutrition Education and Behavior. 2013; 45(5):392-403. Baral R, Davis GC, You W. National, Regional, and State Level Estimates of Returns to Scale in the Expanded Food and Nutrition Education Program. Journal of Agricultural and Applied Economics. 2013; 45(2):203-216. Baral R, Davis GC, You W. National, regional, and state-level estimates of returns to scale in the Expanded Food and Nutrition Education Program. Journal of Agricultural and Applied Economics. 2013 May. Baral R, Davis GC, Blake S, You W, Serrano E. Utilizing National Data to Estimate Average Cost Effectiveness of EFNEP Outcomes by State/Territory. Journal of Nutrition Education and Behavior. 2013; 45(2):183-187. Baral R, Davis GC, You W. Consumption Time in Household Production: Implications for the Goods-Time Elasticity of Substitution. Economics Letters. 2011; 112(2):138-140. Baral N, Stern MJ, Bhattarai R. Contingent Valuation of Ecotourism in Annapurna Conservation Area, Nepal: Implications for Sustainable Park Finance and Local Development. Ecological Economics. 2008; 66(2-3):218-227.